Would do you like to have an opportunity to have a real experience in participating in research? Then you might be interested in this! Are you a family caregiver of a patient with dementia? Would you like to help us to improve the care delivered to dementia patients by General Practitioners (GPs)? You can do that by participating in our study. 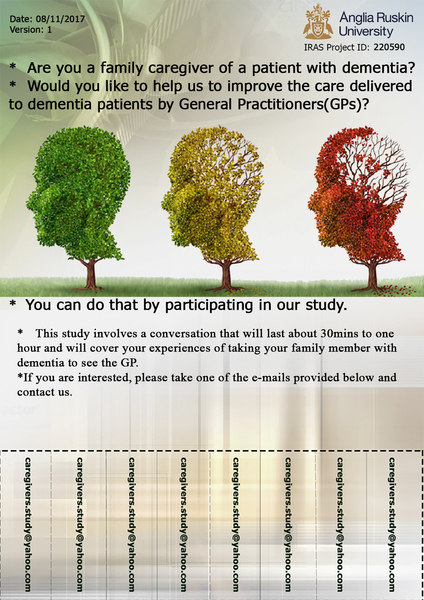 This study involves a conversation that will last about 30mins to one hour and will cover your experiences of taking your family member with dementia to see the GP. If you are interested, please contact us on one of the e-mails below. PhD Research Student Anglia Ruskin University.